Dulles, VA. March 1, 2017 – Reston Limousine CEO Kristina Bouweiri is challenging her fellow Loudoun residents to help end the disparity between the county’s reputation as one of the wealthiest in the country and its below average philanthropic contributions. 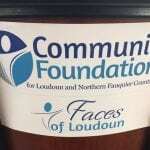 Named honorary chairwoman of a new campaign called Faces of Loudoun, Bouweiri opened the public debut of the initiative on March 1 at Northern Virginia Community College’s Loudoun campus by sharing how she came to be involved. Foundation Board President Kristen Langhorne and Executive Director Amy Owen are spearheading the campaign after reviewing a study indicating that Loudoun residents donate less than 2 percent of their income to local charities – in comparison, the U.S. average is 3 percent. “When we compare our charitable giving rates to the rest of America—as well as our neighboring counties—our giving is, well, we use the word lackluster,” Owen said Wednesday at the launch. To help give a face to that need, Faces of Loudoun will present the stories of “real people living and working in Loudoun who are experiencing and struggling with ‘real need,’” Owen said. The campaign will promote those stories on social media over the next year. For more information about the campaign, please visit www.endtheneed.org.